Please note that in observance of the holidays, our office will be closing at 2 p.m. (EST), Dec. 22, and will remain closed through the remainder of the year, reopening on Tuesday, Jan. 2. During this season, we take time to reflect upon the good things we have… like our partnership with you. 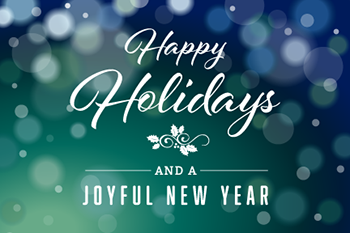 We appreciate working with you and hope that the holidays and the coming year will bring you happiness and success!